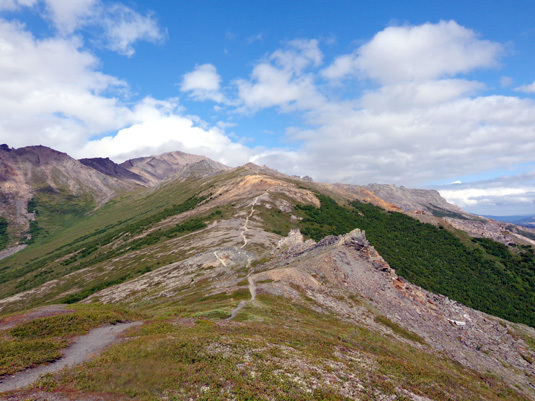 The first time I climbed to Healy Overlook and hiked north along the ridge toward Healy's summit was on August 6, less than a month ago. 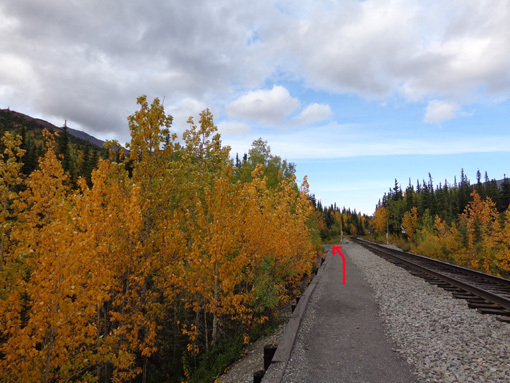 There were also some leaves along the lower Healy trails that were turning orange and red, and I wondered if autumn was already on its way that early. Indeed, it was. 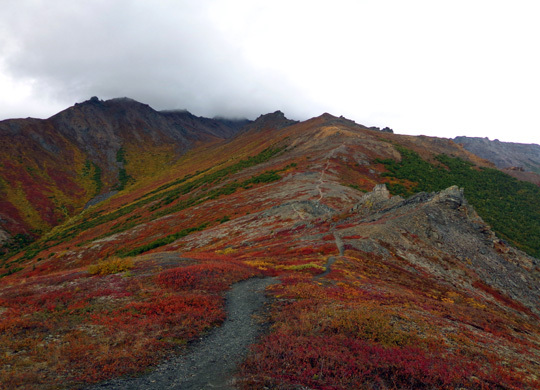 One of my goals on this second visit to Denali National Park was to hike along this beautiful ridge again. 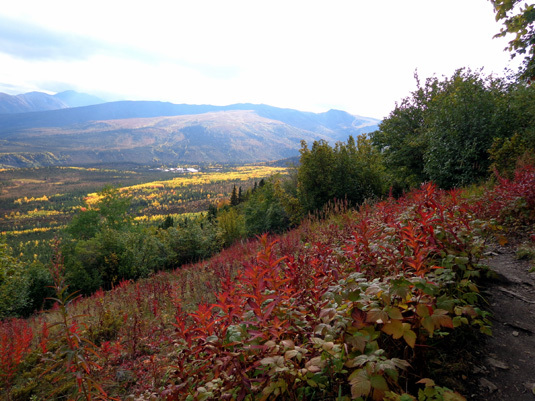 I finally got up there today, and boy, has the foliage changed significantly in just under four weeks! 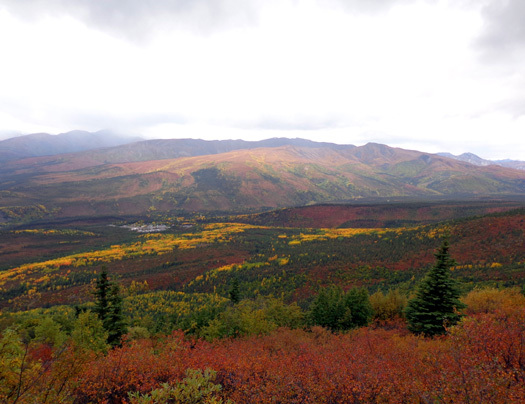 There's no doubt that autumn has arrived at Denali and it's 'way more colorful than summer. 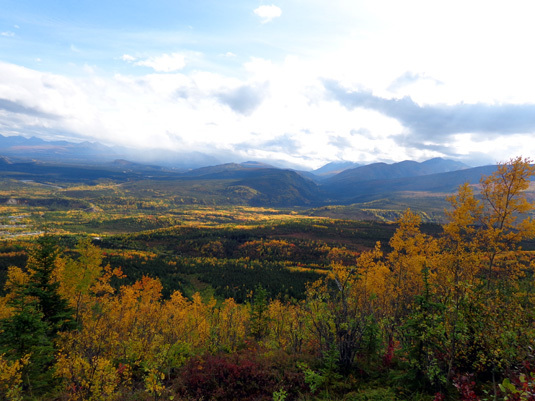 Here's what that same viewpoint on the ridge looks like today, all dressed up in its bright fall finery where "every leaf is a flower:"
The taiga terrain down in the trees and taller shrubs was also a tapestry of yellow, gold, orange, red, and maroon. All the remaining photos in this entry are ones I took today. But I'm getting ahead of myself. Let's start the journaling a bit earlier . 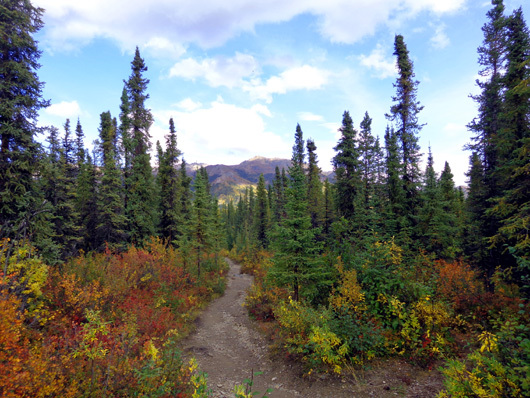 . .
CABIN FEVER: TIME TO GET OUTSIDE! Jim and I both stayed inside most of the last two days because of clouds and/or rain and chilly temps. We were both tired from our strenuous hike (me) and bike ride (Jim) four days ago but we didn't need that much rest; we mostly wussed out because of the weather. 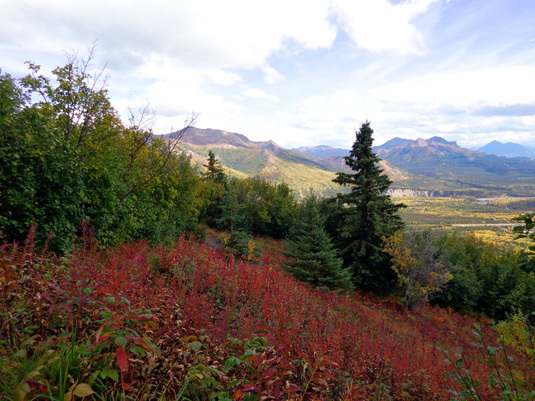 It was definitely time for me to get outside for a longer hike, not just because of cabin fever but also because it's our last full day at Denali. I didn't want to regret "wasting it" later. 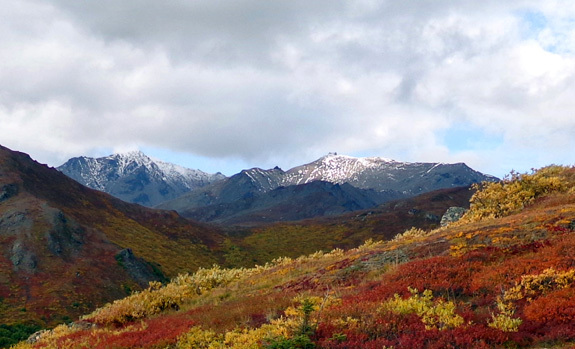 With some blue sky this morning, Healy Ridge looked much more inviting to hike. Fortunately the weather cooperated a little bit better today. It was still rather damp and chilly (50s F.), windy, and ran the gamut from sun to rain -- mostly cloudy with some periods of sunshine in the morning and afternoon, as well as a few rain sprinkles after lunch. I also ran into a little bit of sleet and a whole lot of wind at 3,600+ feet elevation on Healy Ridge in the afternoon. It snowed again above the 4,000 foot level. 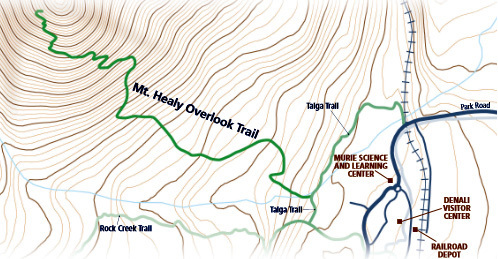 I thought there would be more people on the Healy Overlook Trail than there were. 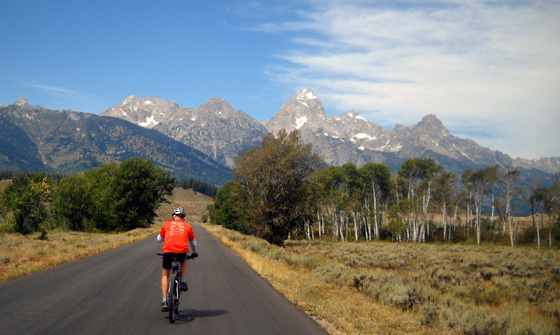 I didn�t see more than two dozen people when I was going up and coming back down. Jim let me off at the trailhead at the railroad and picked me up when I was done. That way he had use of the truck during the 4+ hours I was gone. 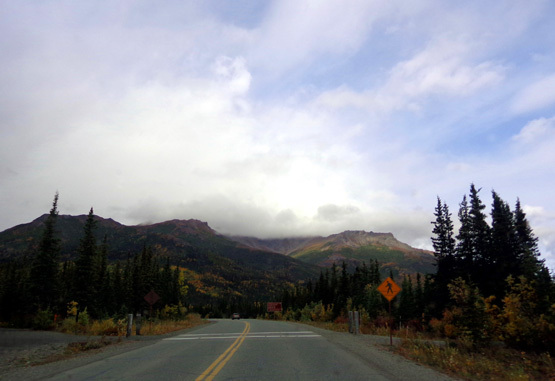 As on August 6, I went beyond the overlook to the undulating ridge but didn't go quite as far as I did in early August. 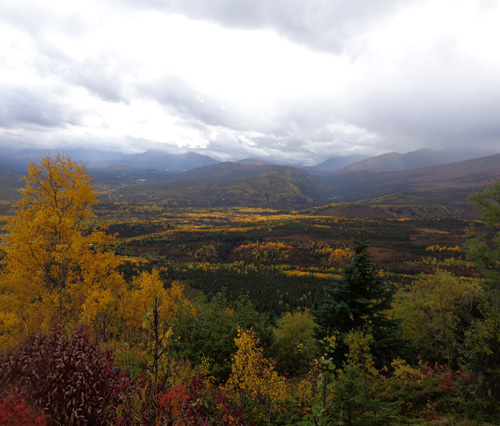 I took some of these photos on the ascent and some on the descent. 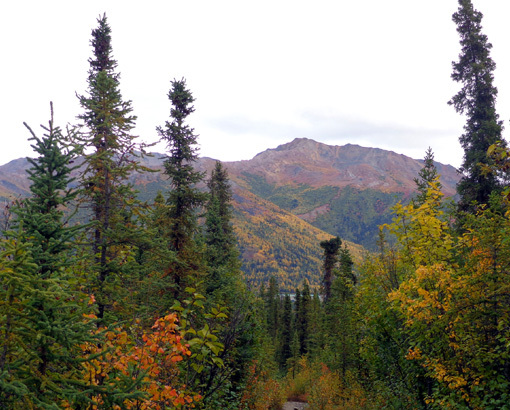 I often turn around to see the views behind me, especially on a loop or one-way hike but even on an out-and-back hike. I was out long enough today for the light to be different on the return because the sun was shining more then. 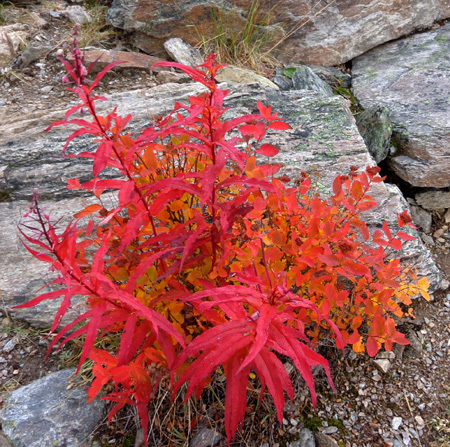 There are numerous low red shrubs like this all the way up through the sub-alpine areas of the trail. 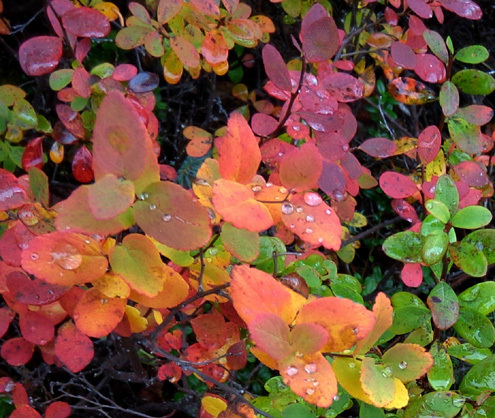 Note the raindrops on the leaves. 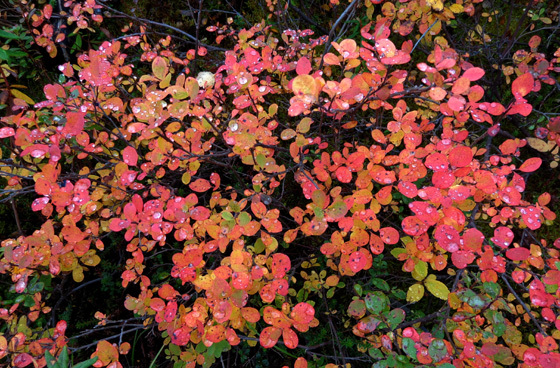 This deciduous shrub is different and grows taller than the ones in the photos above it. 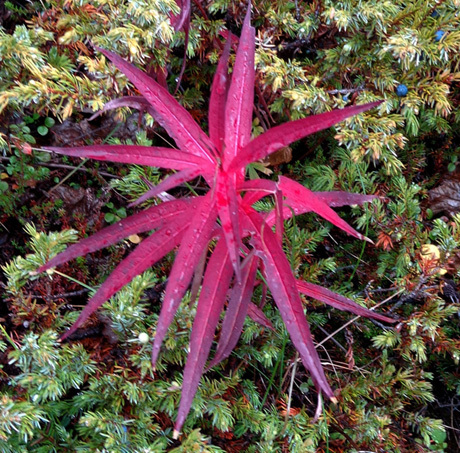 There are also many pretty reddish-pink fireweeds that have lost their blooms; their stems are even brighter than the flowers were a few weeks ago. 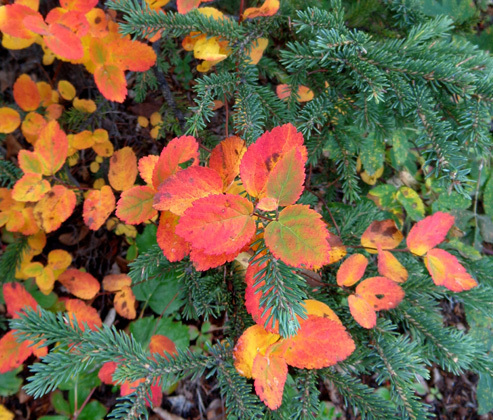 Note the blue-colored berries on the spruce branch in the upper right corner. 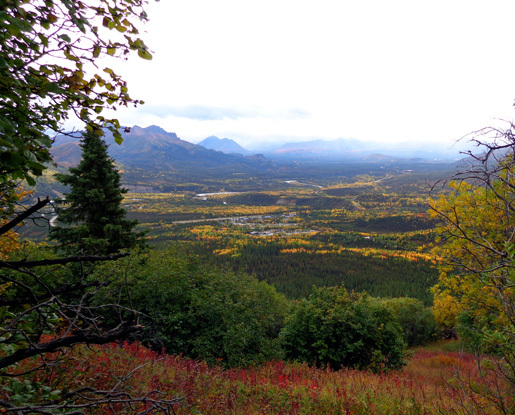 Looking SW to the park headquarters and bright yellow aspen leaves in the valley. 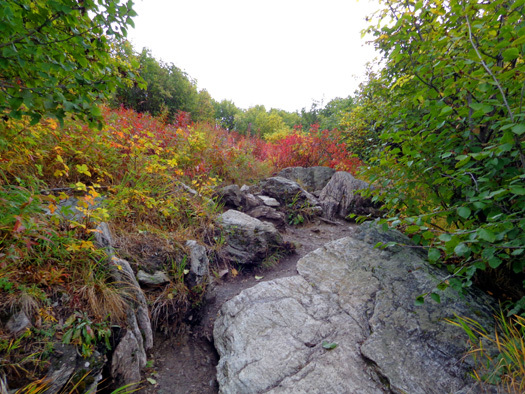 This is the easy part of one of the rock climbs on the Healy Overlook Trail. All the leaves seemed brighter and more beautiful the higher I climbed. probably because they get more sunshine where there are fewer trees. 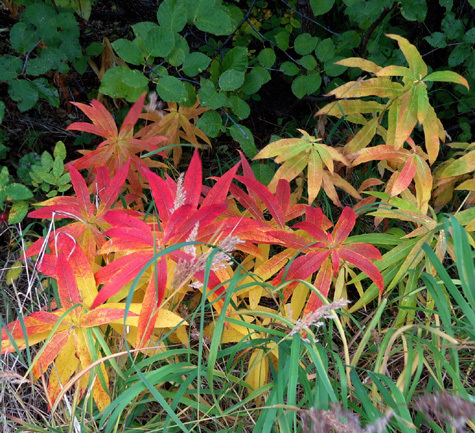 Is it any wonder the meadows and hillsides look so magnificent in autumn? 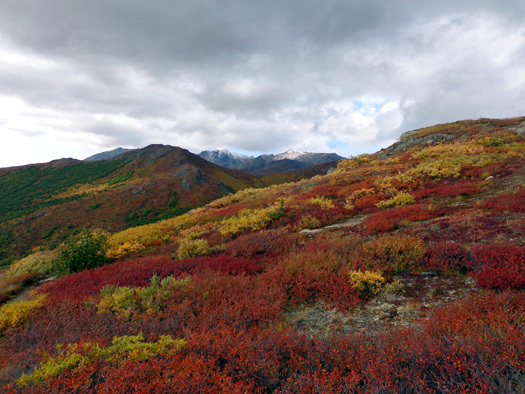 Just think of the gazillions of these plants, shrubs, and trees growing over six million acres of wilderness at Denali . 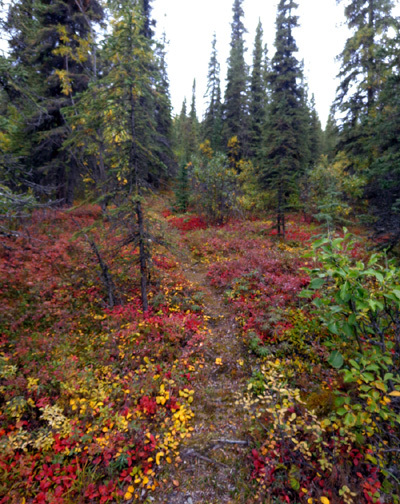 . .
You've got to see this place in the fall! If it's not already on your travel bucket list, add it. 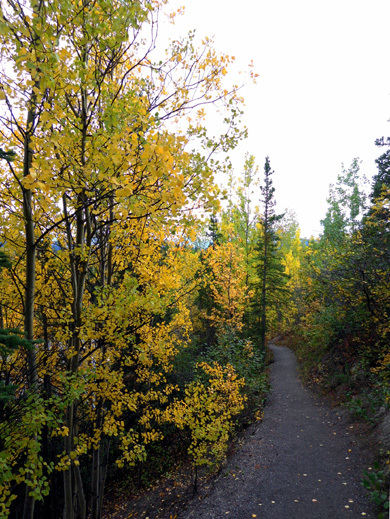 By now most of the aspen leaves are mostly gold and orange, even at the lower elevations near the park entrance. I could hear the dogs barking as I hiked up to/down from Mt. Healy. 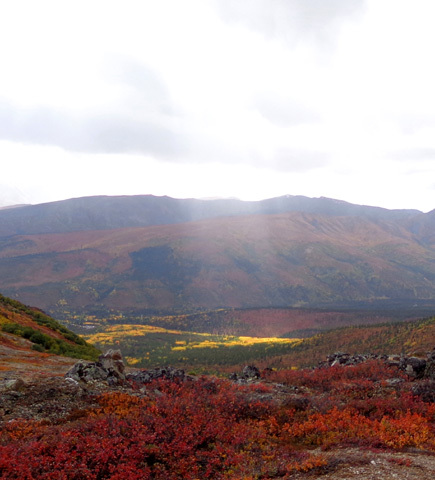 Sometimes the sun would peak through the clouds and it looked like Mother Nature was shining a spotlight on them.